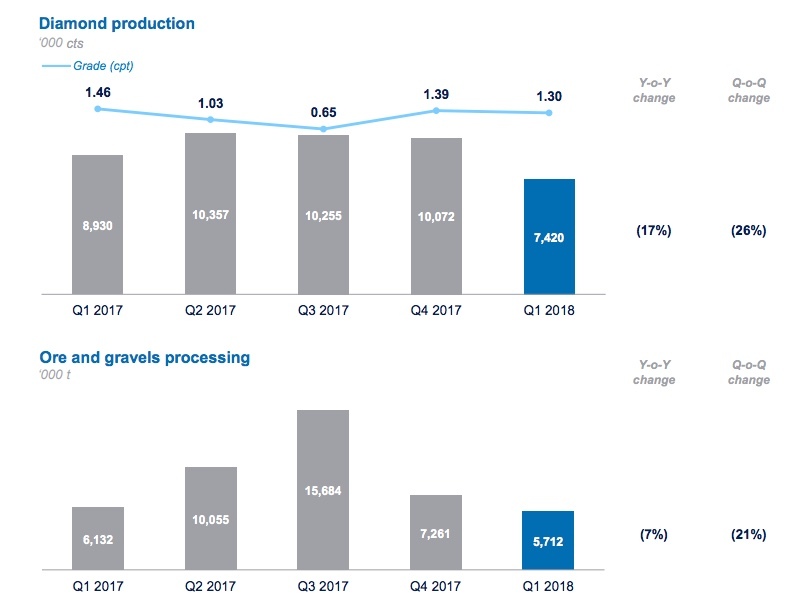 Alrosa (MCX:ALRS), the world’s top diamond producer by output, saw its total production fall by 17% in the first three months of the year mainly due to the halt of its Mir underground mine and lower-grade ores processed from the Jubilee pipe. The Russian miner produced 7.4 million carats in the quarter, compared with 8.9 million carats in the same period of 2017, and 10 million carats in the preceding quarter. The company noted that the output decline was also partially caused by the closure of its Udachny open-pit mine, which has now become an underground operation only. As a result, the unit’s production decreased by 19% when compared to the same quarter last year, to 817,000 carats. Other divisions helped offset Udachny’s results. Mirny, comprising alluvial deposits, the Mir underground mine, and the International underground mine, posted a 46% year-on-year decline in production to 1.17 million carats. Operations at Mir, located in eastern Siberia, were suspended in August 2017, after water flooded into the mine shaft from the open-cast above trapping 151 people. 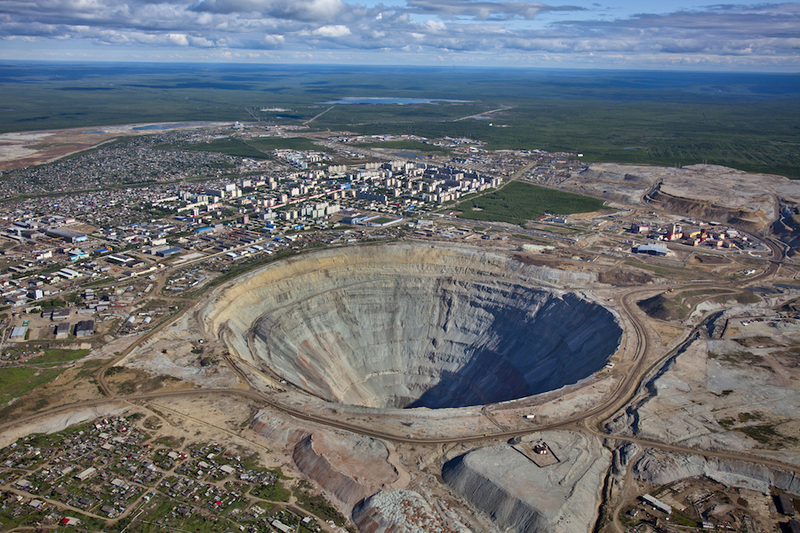 Alrosa said it was assessing technical solutions for resuming operations at the deposit. The company’s Lomonosov division’s production jumped by 49% year-on-year to 729,000 carats, it said. But Nyurba’s output fell 15% to 1,9 thousand carats in the period. Last month, Alrosa unveiled its own synthetic diamonds detector, aimed at cracking down on dishonest suppliers that mix lab-made stones with mined ones. The effort complements rival De Beers’ recently launched initiative to create the first industry-wide blockchain platform, which will enable greater tracking of gems being traded worldwide. The technology, which the Anglo American’s unit began developing last year, is currently being tested in a pilot program at Sierra Leone.